When you start crocheting, or doing anything, you need to have the right supplies. But sometimes there are just too many options and variations to choose from. Have you decided you wanted to crochet, but don't know what supplies you need? Well, this checklist is for you! In this checklist, I list 5 of the top tools that I think every crochceter needs to have, and nothing they don't. Not only do I list the type of tools and yarn, but also my favorite specific items. That way, you can build your kit with products that I already use, test, and trust to be right for me, every single time I pick them up. 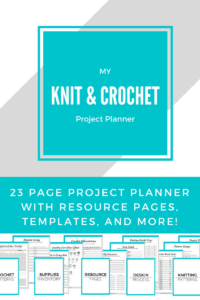 Fill out the form below to subscribe and get access to the resource library where you can find the 5 Things Every Crocheter Needs checklist + more freebies! There's also a free ebook called The Beginner's Guide to Crochet available there, with 15 tutorials, 15 videos, and 15 patterns to teach you crochet. If you're serious about learning to crochet, this checklist and the ebook are the full package!